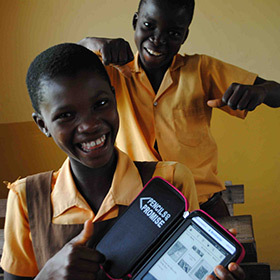 Worldreader provides e-reading solutions through a BLUE Box. 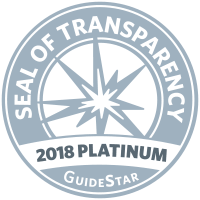 These contain everything you need to bring e-reading to your school or library, including culturally-relevant books curated for your needs and the critical resources needed for your program’s lasting impact. You can do this using the devices you already own or the ones provided by us. Worldreader’s library contains the most e-books written and published in Africa and world-class books donated by partnering publishers. Worldreader has five years of experience testing and perfecting program support, which maximizes your impact. Worldreader offers a user-friendly, tested, and approved solar solution. What’s in a BLUE Box? 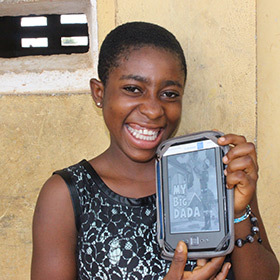 A BLUE Box is designed for schools and community libraries in sub-Saharan Africa. It can serve approximately 50-500 readers depending on the program model. Below are standard packages, but they can also be customized for you. Contains protective cases & shipping. Include 3 years of low-cost device replacement. High quality books, at a discounted price. 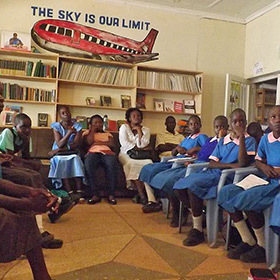 Booklists curated for you by a Worldreader librarian. E-books delivered to your devices. Includes solar panels, USB hubs, adapters, and more. Worldreader Advantage: unlocks books in the Worldreader Digital Library and provides access to exclusive book sales. Resources to train and empower teachers, librarians, and community. Inclusion in Worldreader online Community of Practice. 3 years of complimentary access to annual Digital Reading Summit. *additional cost, please inquire for more information. Before the [e-reading] program was introduced, EGRA test scores from the 6 pilot schools were terribly low. Comparatively, at the end of the school year after introduction, a record high of 89% of the students in Grade 6 are reading at the standard proficiency level of 45wpm. These compared with 56% of Grade 6 students from our non-program schools, indicates a markedly significant difference in literacy rates brought about by our program. A feat considered worth sharing. I am so fascinated by the e-reader especially when I have it for myself for one hour… I read as many books as I can… It is the best time of my day. It has really changed the reading culture in the village. Now students use the e-readers to review for their exams. Teachers use them for reference material, and even the community members read vocational books.